Nikki Giovanni at Esowon Books, L.A., 1/7/11. If you're in the L.A. area, you'll definintely want to stop by Esowon Bookstore for an evening with Nikki Giovanni on Friday, January 7, 2011. 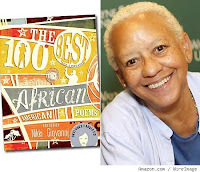 The world-renowned poet, activist, and academic will share an evening of poetry, stories, and wisdom from two books she's recently put together -- 100 Best African American Poems and Hip Hop Speaks To Children. Both books will be for sale at Esowon Books. I've seen Nikki Giovanni speak before at other events, and she's definitely worth the time to go see. Definitely a great way to start the New Year!